The program began with a few leadership challenges designed to get students thinking about their own leadership styles and strengths. To practice different ways of communicating, they worked as a group to achieve a series of goals, such as organizing themselves by birthday and number of siblings without being able to speak to one another. They thought about what defines leadership and agreed to a set of group expectations for the rest of the program series. Each following day focused on a different component of the landscape: trees, rocks, and animals. 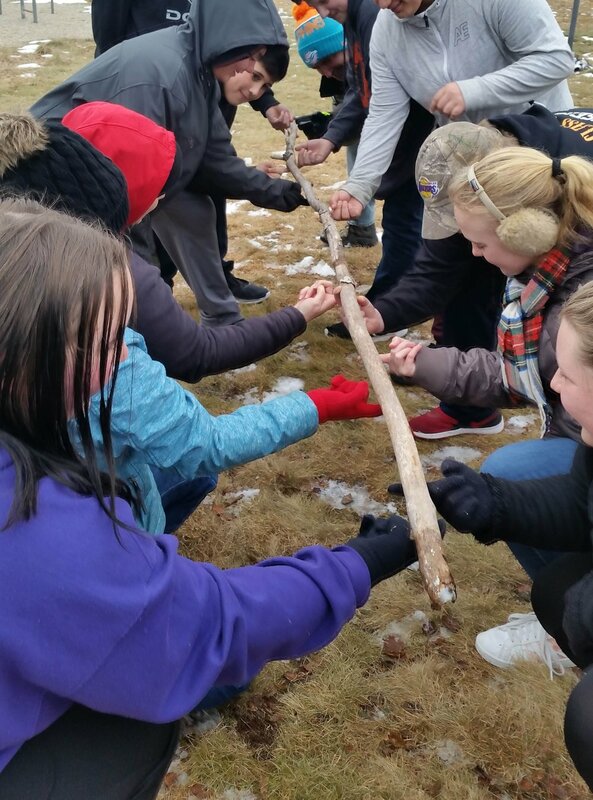 They observed the landscape around their school and played games that both challenged their leadership skills and encouraged careful observation of their surroundings. In one game, students had to carefully lead their blindfolded partners through the woods and have them identify an individual tree by touch alone. In another game, they acted out the different ways rocks form in small groups. They also tested their individual skills of blending into their environment, which was rewarded by a sighting of a snowshoe hare camouflaged against the snow. As the series wrapped up, the students reflected on the activities and challenges of the past several weeks and considered how they would lead a group of younger students in the same games in which they had participated. Challenged with this question, they shared key takeaways from their time studying leadership: that it is important to tell younger students “the why” behind doing different things and to make sure the students feel safe before starting an activity. Learn about the experiences Jonesport 4th and 5th-graders had during Forest Fridays during early fall 2018 here and the Pre-K and Kindergarten Forest Friday series here.